Parents want their children to do well in school so that they can go out into the professional world and become successful, but finding the money to fund the ever-increasing school fees and then even more expensive tertiary education fees is sometimes completely out of some parents’ reach. Cash-strapped parents are often forced to leave the financial responsibilities of paying for university or college education to their children. After all, they have to take responsibility for themselves at some point. But many South Africans do not realise the burden of the debt they are putting on themselves by taking a long-term, deferred student loan, whereby students pay interest on the loan while studying and start paying off the capital amount when they start working. According to the most recent figures released by Higher Education South Africa (HESA) - students in the country are in arrears of more than R2,8 billion with universities alone. Student loans were initially perceived as a vehicle to drive access to higher education for poor or previously disadvantaged students. The intention was to give youth the opportunity to have higher lifetime incomes as a result of their education. Instead this system has given birth to a generation of debt-ridden, unemployed young people, held captive by insurmountable debts before their careers have even begun. One of the main contributing factors to the student dropout rate is the lack of understanding about additional costs associated with higher education. Even for those who are fortunate enough to receive a bursary, student financial aid is typically limited to covering tuition fees alone. Students who had hoped to pursue their dreams are waking up to the shocking reality of extra expenses incurred from textbooks, transport, food, accommodation and other living costs. This lack of preparation for the associated costs is forcing many students to drop out. The situation is compounded further when unqualified students can’t find work, which means they become incapable of repaying their massive debts. Most student loans can take between five to ten years to pay off, as the student pays only the monthly interest on the loan until they start working. 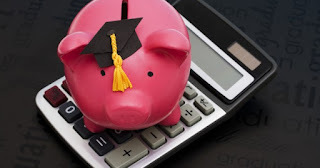 This means that many students are stuck in a vicious cycle of paying off compound interest, which is interest accrued on top of interest that has been added to the principal loan amount. Newly-employed graduates also have differing rates of income, and some find it increasingly difficult to pay off their student loans and make ends meet over the first few years. A student loan can be almost as big a commitment as buying a car or house, and may hinder the ability of the graduate to get loans for either of those items. This is the reason why Eduloan believes in providing short-term loans, which can be paid by an employed sponsor (who could be a parent, a relative or a friend). The interest rate is lower because the repayment period is shorter. That means that by the time the student has finished studying, their loan will either be paid off in full or nearly paid off, which gives them the freedom to start making the money they deserve to make, as soon as they graduate. A key differentiator between Eduloan's study loans and those offered by other financial institutions is the interest rate. Eduloan offers loans at a very competitive interest rate, payable over shorter periods of time. If you’d like to find out more about how our loan applications work, give us a call on 0860 44 55 55 or visit www.eduloan.co.za. Your 24-hour adventure starts now! Matric results – where to for the class of 2012?